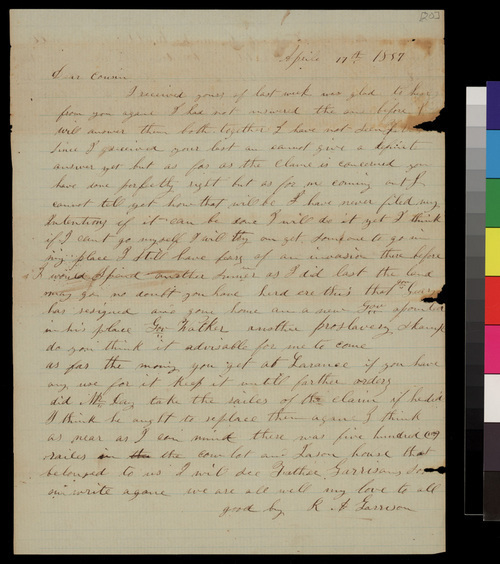 Rachel A. Garrison, the widow of Samuel L. Adair's cousin, David Garrison, writes Adair about the family's land claim in Kansas. She notes that a new pro-slavery "skamp" (Walker) had been appointed as territorial governor. She inquires if Mr. Day took 500 rails from her claim and states that, if he had, he should replace them. In a post script, she asks Adair to subscribe to the "Herald of Freedom" and have it sent to her.